I love onions. They add flavor to everything they touch from sandwiches to stews. But, onions don’t love me. In fact, they wreak havoc on my digestive tract. So many recipes have onion as an ingredient. If it’s eliminated, the soup, stew, or whatever is one blah meal. It’s not one of those ingredients you can easily substitute with another. I’ve got a work around that will keep your stomach happy, but won’t compromise taste. It’s simple really. Instead of chopping or mincing an onion into small pieces, halve it, cut it into large chunks, or cut it into rings. 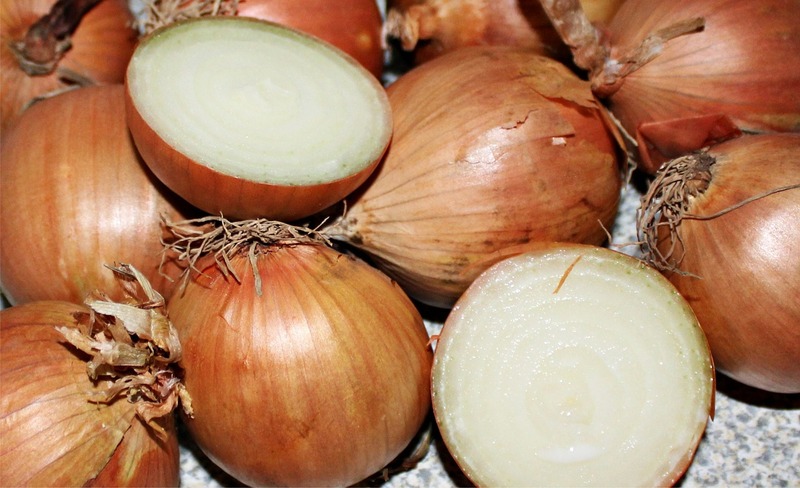 The onion still imparts its flavor to the dish, but it can be removed easily prior to serving. The shape I use depends on the meal. It is easy to add a half of onion to mashed potatoes, stew, or soup. When the food is ready to serve, just spoon out the large chunk. If someone else wants to eat it, they are more than welcome to it. For things like roasted vegetables or casseroles, a large half just won’t do. In this case, sliced rings or chunks will work better. Just place them on top of the uncooked food. Bake as normal, then remove the chunks and rings when done. I used to avoid any recipe that had onion in the ingredient list. One day, I was thinking of my mom’s mashed potatoes and how she always put a half of onion in the pot for boiling. Her potatoes were always delicious. It dawned on me that this would work well for many dishes. That’s my mom…one pretty darn smart cook! You’d be surprised how much oniony flavor seeps into the pot while your dish is simmering on the stove. If you have the same problem as me, try this trick. Your taste buds will be happy and so will your stomach! Good idea… to get the flavor without the pain! Linda, Absolutely! Sometimes when we have digestive issues we think we have to eliminate everything that bothers us. 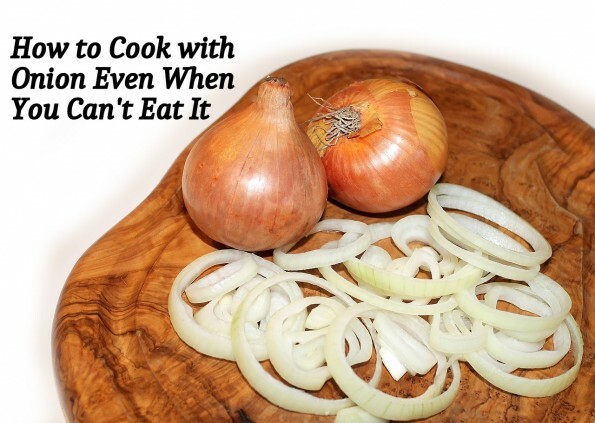 This is an easy way to get that onion flavor without all the trouble. When I saw this, I immediately thought how different life would be without onions. I use them in nearly every savory dish I make. They’re a part of nearly every salad, one way or another too. It’s wonderful that you have found a way to get the flavor without the pain. I’m sure this will be helpful to others who find onions difficult to digest. Thank you for the hint about cooking potatoes you plan to mash with an onion. Now that you mention it, I think my mom did that too. Perhaps that’s why my mashed potatoes never tasted as good as hers. Going to file this in the back of my mind for the holidays. Kathryn, There are some foods you can replace and some you can’t. 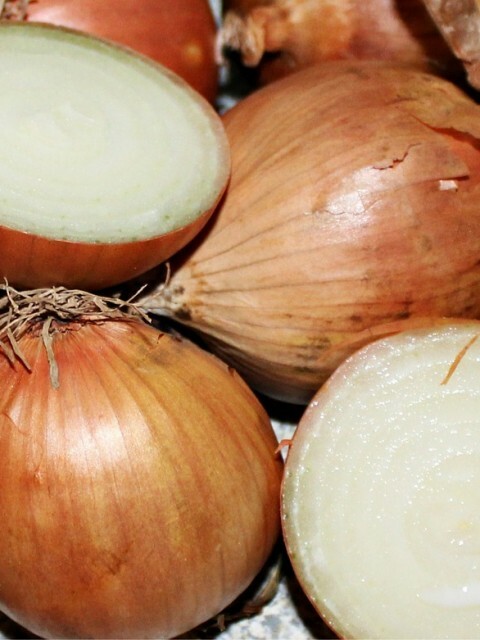 Onion is one that doesn’t have a counterpart that gives that flavor boost. Soup and stew would not be the same without it. My mom always put a half of onion uncut in her pot of boiling potatoes. I’ve cooked them the same way myself. It took me awhile to realize that if it worked for mashed potatoes it would work elsewhere, too. I will have to try this. As onions is something my family adds into meals alot. As the flavors can’t be matched. Since, my boyfriend and I both have GERD. We have to stay away from onions and garlic. I think adding big piece like you suggest would work by getting the flavor but not the onion it self. Sandy, I thought I was the only one who couldn’t tolerate onions. Turns out there are many others like me. It does add a unique flavor to foods that is missed when not added. There is no simple replacement for onion in recipes.